One of the most recent food supermarkets in the city, considered to be upmarket. Without a doubt the interior is the best of any of the supermarkets in or near the city, but this is not saying very much. The store was ten years in the planning, not untypical in England, and demonstrates some of the worst effects of the planning system. The location is near a busy junction in the middle of Trumpington, so makes the traffic there much worse. 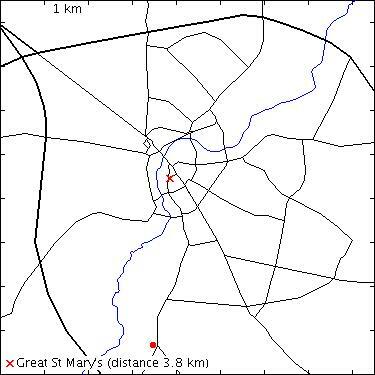 It should have been placed about a kilometer south, near the M11 motorway. 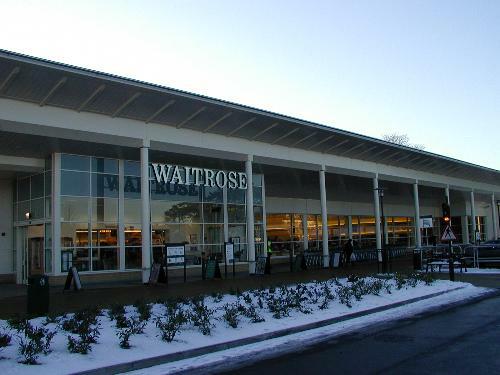 Instead the authorities allowed only about three quarters the amount of car parking which Waitrose asked for and have placed a large park and ride lot where the store should have been, presumably expecting people to leave their cars there and take a bus the final short leg to the store. The land for the store was taken from the grounds of Anstey Hall, whose reflection can just be seen in the glass to the right of centre in the photograph. In 2005 the store was extended forwards.